Q. 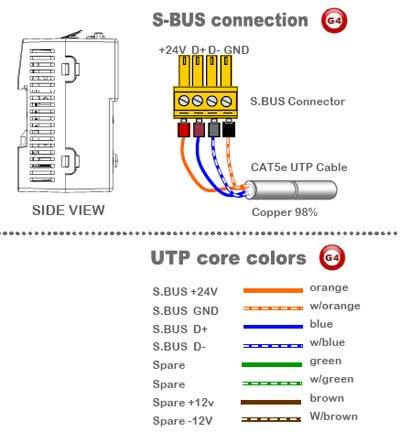 How many z-audio units we can connect in smart bus network? A. Z-Audio2 is an IP based and also is smart-bus G4 enabled , thus you can connect 1470 devices easiely . .
Q. Can we use the FTP function in the z-audio without inserting SD card? A. Yes, the New G4 Series has enabled full control of all different Sources even if No SD Card is available. However, we always Prefer the SD card to be inserted to make the process of Source selection faster and avoid detection Time. A. Yes you can do that when Playing FTP or when same source is connected to PA or Audio In. of all Zones. Also can do it using the PLM softwre, or The App installed in the iphone for FTP and source control. Q. Is the z-audio PA is stereo ? A. yes the PA paging function of z-audio G4 is stereo . Q. can we control many z-audio from 1 DDP panel? A. This is Tricky question, partially yes: because you can control several Z-Audio2 devices by using scene like all off and so on, but you can control full function to only 1 z-audio from 1 DDP only to select songs album, read tacks and so on. Q. How many Z-Audio totally separate zones can be added to Smart-BUS Network? Q. 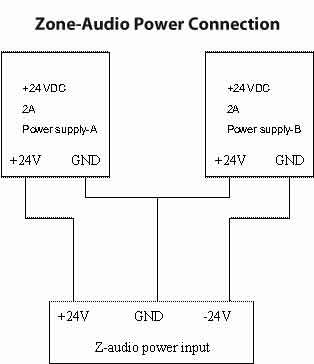 How Many zones is one Z-Audio and what does it include? Q. Can we control Z-Audio using PC? A. 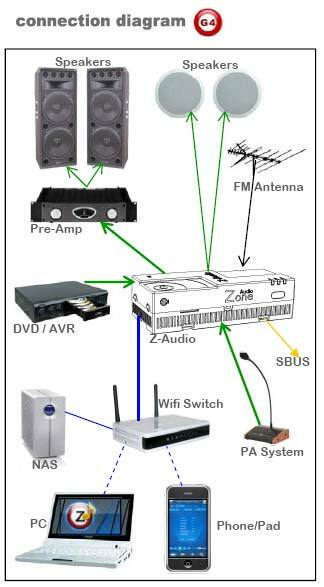 Yes, you can control Any Z-Audio within the SBUS Network using your pc utilizing our ready software or any third party. (our ready software are: HAC, Mazarati, PLM) Note: only PLM allow you to send PC stored music to any selected Z-Audio2 zone or Group. Q. Do you have telephone Apps ready for controlling of Z-Audio2? A. yes, we have Iphone/Ipad App, and we have the Android App. Q. 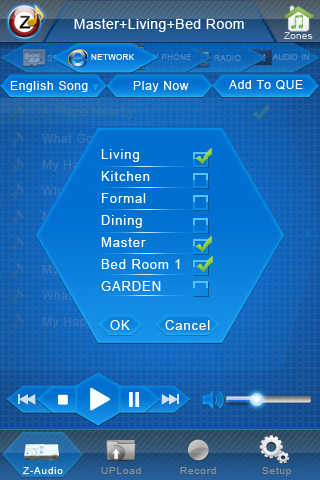 What can we control using Z-Audio2 I.Phone App? A. ZA-App gives you the Power to select music from 5 different sources per zone: Radio, SD Card, NAS HDD or PC, Local Audio IN, or your phone stored Music. 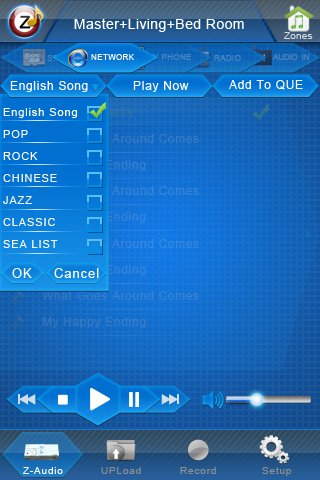 Also, it allow you to select the Playlist, the song, the queue, add song or delete or modify play order within queue. 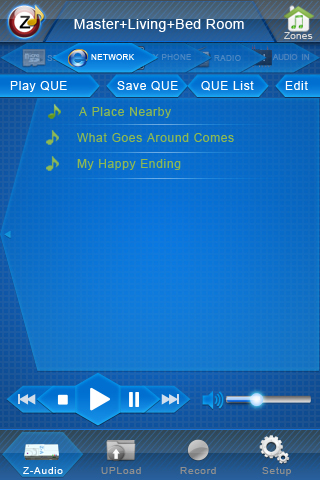 AZ-App also give full control ability to play, pause, FW to next track, BW to previous track, control volume, or stop and power off the Z-Audio. New Group control Feature is added for Parties enabling selection of Multiple Zones and grouping them as one to synchronize playing song, queue and volume level. Moreover, ZA-App allow the user to record and to send broadcast Audio Announcement from his hand held telephone onto the selected Zone or Group. Q. Where can we install Z-Audio2? A. you can install Z-Audio2 near DVD in any room, you can install it also centrally in control room, or can install it directly near Speaker above ceiling using the same speaker opening as sliding space to mount the Z-Audio2 module. -SD card & NAS Play Lists. 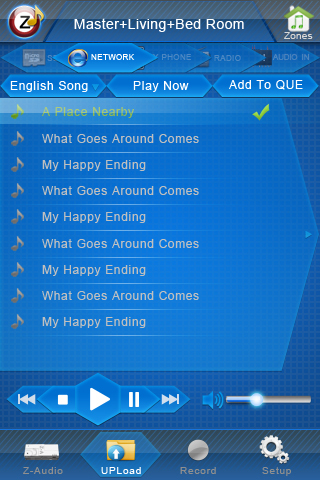 Play List direct on Insert.